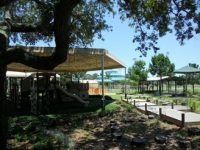 Hurlburt Child Development Center at Hurlburt Field, FL is the 3rd Certified Nature Explore Classroom in the state of Florida, and the 3rd site to be certified at Hurlburt Air Force Base. 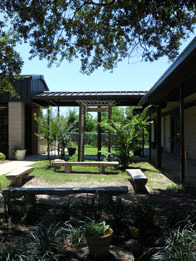 The CDC outdoor classroom is divided into thirteen distinct activity areas. Loripetalum shrubs and low regional stone walls help to define each of the areas while giving children interesting colors of red and green, an aromatic scent and various textures to explore. This space contains a wonderful mix of sunny green spaces and shaded areas. 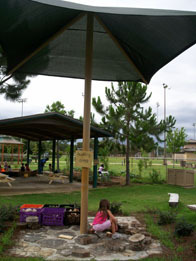 Large umbrellas, canopies and permanent structures are utilized to provide shade for comfortable play in the Florida sunshine. The classroom incorporates plenty of room for the children to climb and crawl without running into each other. The Open Area is covered in grass and contains a hill in the center. This is a unique feature that adds a wonderful quality to this area. Children may run along the top of the hill or roll down the sides. The space is made up of wooden and natural looking elements while covered in various natural materials, such as mulch, grass and regional stones. The garden area is made up of four planter beds with a mulch covered pathway running between them. Paths of different materials run throughout the classroom. 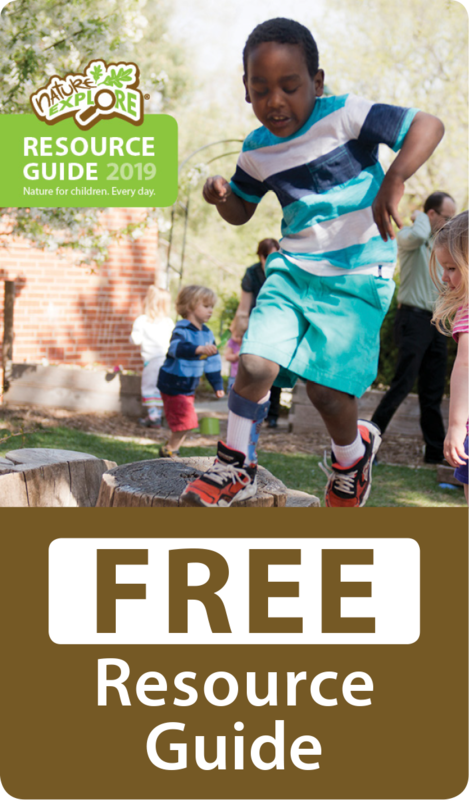 Tree stumps and balance beams allow children to practice jumping and balancing while gaining self-confidence and a sense of control over their bodies and environments. Rain barrels collect rain water to be used in various activities such as watering plants, cleaning outside furniture and for use in the water play area. Each area has a sign and a laminated visual image that helps children understand the layout of the space and how each area is meant to be used. Various nature education and family involvement opportunities are held in the outdoor classroom throughout the year. 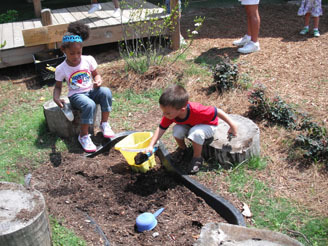 Gardening Day, Arbor Day and Nature Appreciation Day are just a few of the ways that this nature Explore Classroom continues to inspire and educate children and their families to connect with the natural world.